PERFECT SIZE FOR PERFECT TASTE- At 700ml our large gin glasses have the OPTIMAL capacity to build the ULTIMATE gin cocktail. Each Gin and Tonic Glass can hold tonnes of ice, your FAVOURITE gin, tonic to TASTE and room for garnishes. The wide topped ‘copa’ design has a 11cm diameter, which releases the intense botanical aromas from your Gin, unlocking a more intense taste experience. PERFECT GIFT SET- Each stylishly designed GIFT BOX contains 2 x Gin and Tonic Glasses, a ROSE GOLD double-sided Shot Measure (25/50ml) and twisted bar spoon! Great for BIRTHDAYS, WEDDINGS, ANNIVERSARIES, CHRISTMAS, NEW YEARS or any OCCASION! 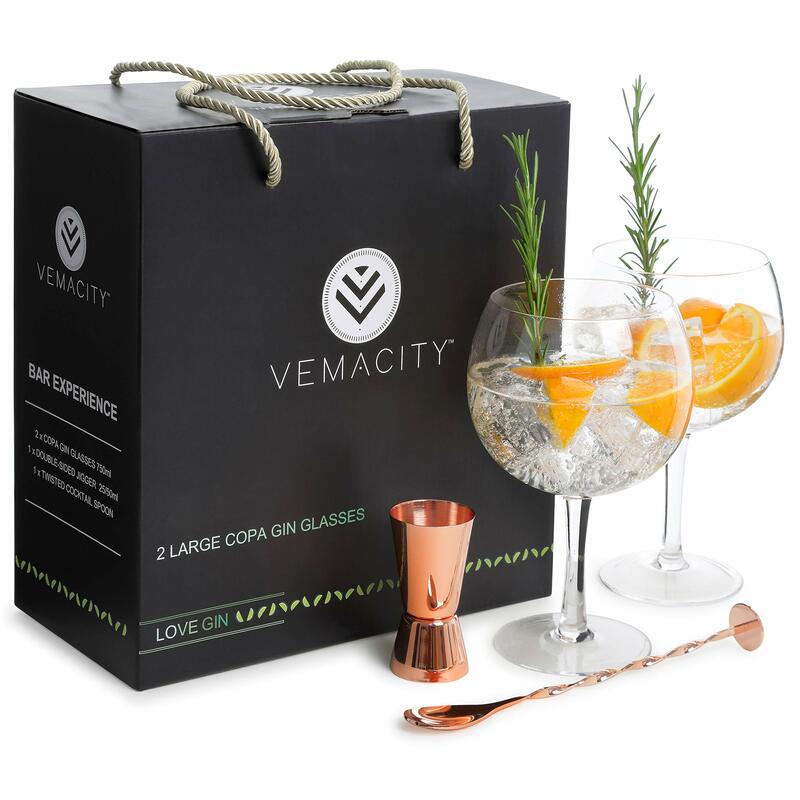 PROFESSIONAL TOUCH – Our Copa Gin Glasses come with BAR QUALITY Rose Gold cocktail accessories to build the PERFECT Gin & Tonic! NAIL your recipe using the double-sided measuring cup to pour your Gin and one of our cocktail stirrers to BLEND it all together. Every sip out of our Elegantly Styled Glasses will delight you and your fellow GIN LOVERS. With an impressive 700ML capacity, the glasses have the iconic balloon shape you are after. At 19CM tall, it’s the perfect Height to create that Eye-Catching Bar Quality Look and Fit in your home cupboard with NO PROBLEM. Become an expert crafter of Gin & Tonic using our bar quality equipment. Our Stainless Steel 201 (Food Grade) Double-Sided Jigger pours both 25ml and 50ml Measures, so you can expertly BALANCE FLAVOURS. Use the Rose Gold 201 (Food Grade)Twisted Mixing Spoon to bring the flavours together. IMPRESS your FRIENDS with a TRICK by using the spoon to cascade the tonic into glass! Enhance the Gin & Tonic experience by drinking out of a special glass. The wide topped ‘copa’ design has a 11cm diameter, which releases the intense botanical aromas from your gin and tonic, unlocking a more intense taste experience. Nowhere else will you receive professional bar quality equipment at such great value. Each box contains 2 x 700ml Balloon Glasses, 1 x Double-sided 25/50ml measuring cup and 1 x Twisted Cocktail spoon. All materials used are BPA free, food safe and of the highest quality. AUTHENTIC SPANISH EXPERIENCE- Our elegant design is based on the TRADITIONAL ‘Copa de Balon’ a.k.a. Gin Glasses Balloon shaped for the best taste experience. The EYE-CATCHING large bowl makes every drink special and is guaranteed to leave a lasting IMPRESSION on you and your friends! CUSTOMER SERVICE YOU CAN TRUST- Our core value at Vemacity is to create TRULY MEMORABLE customer experiences. If, however you encounter any problems reach out to us directly and we will turn that frown upside down and that’s a PROMISE.